Sometimes, a pet gift is less about honoring the pet and more about honoring the special pet owner. Here is a project that does both. 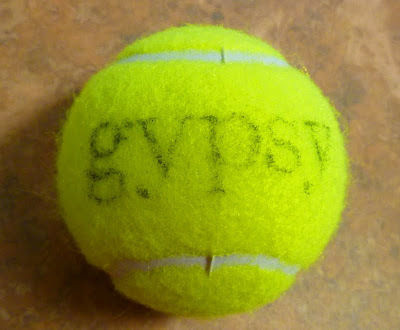 A custom dog toy- the personalized tennis ball. Printed out the name I wanted to personalize to the ball to fit in the area and taped it over a strip of generic office-supply carbon paper. I printed in light gray in order to see the areas I’ve traced when I get to that part. Using a ball-point pen, I filled in the lettering with as much pressure as I could without tearing through the paper to transfer the lettering. Once transferred, I went over the lettering with the fine tip of the wood-burning tool. Be sure that you are in a safe and well-ventilated area when burning synthetic fuzz. It helps to keep the printed lettering near by for visual reference on the areas that may have not transferred well. You can use scissors or a disposable razor to remove some of the heavier fuzz in the area you plan to burn. Lightly wash and dry the ball to remove any remaining carbon residue. 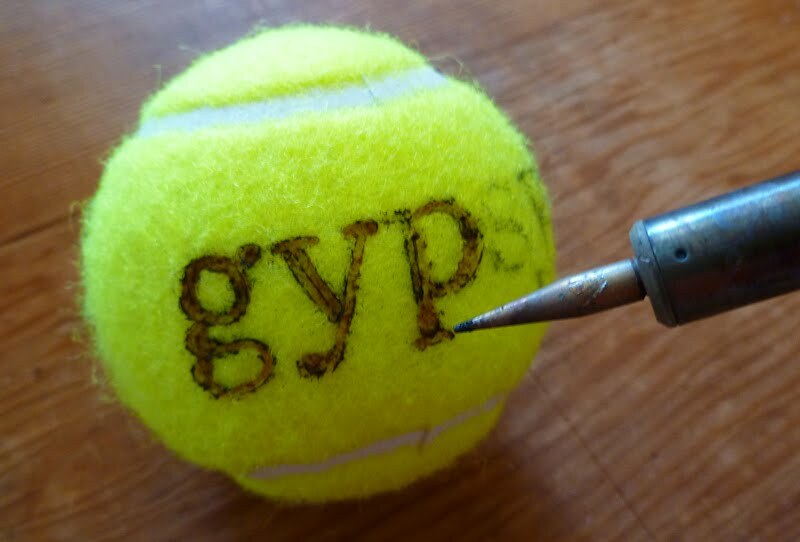 You may also choose to freehand the lettering as I did for my dog’s tennis ball. • Tuck into your dog’s mouth, if you can get him/her to stay long enough, for a fun photo op. • Cut a long slit into the top of the ball for holding a photo of your dog. 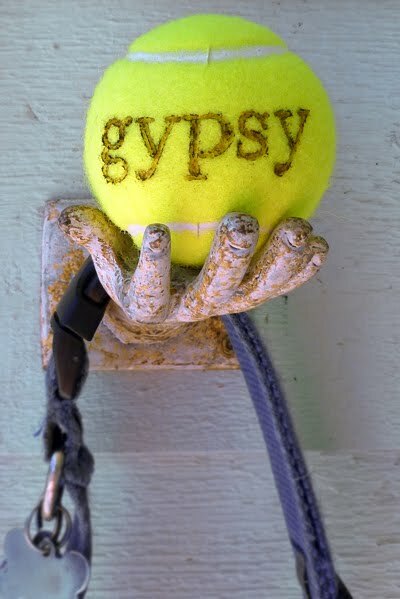 Place ball onto a wooden curtain ring or other similar stand to keep it from rolling away. • Drop several personalized balls into a cylindrical glass container, include photos or pet mementos to create a special display. • Wrap 3 balls in cellophane (you really only have to personalize one) and tie at the ends like a giant candy wrapper as a holiday gift. Or, cinch and tie between balls like sausage links. • With a craft knife, score an X into the top of the ball and push a knotted loop of ribbon, string or rope into the score to create a special Christmas ornament, or to use as a marker for the leash hook. I used striped rope salvaged from a holiday gift bag handle. Who is Gypsy? My sweet mom lives alone in an apartment in Arkansas. Her very dear friend, Don, another tenant in the complex, visits her daily. Don has a special companion, a very chubby little Dachshound, (which I would more lovingly refer to as a foot stool,) named Gypsy. Mom tells me that Don not only reads my blog, but he actually makes some of the crafts I share. Thank you Don! I’ll be sending a care package to Mom soon with the tennis ball gift for your pup included!! This entry was posted in Uncategorized and tagged Christmas Ornament, diy crafts, Dog Gift, Dog Toy, Pet Gift, Pet Toy. Bookmark the permalink. I love this project! But what I really love is that it was for a dauchaund named Gypsy, for that is the type of dog we had as kids, and her name was Gypsy. We miss her lots, even tho she's been gone for about 25 years. Thank you for sharing and the project! Very cute idea! Great for my dog and for a few friends I have who love their pampered pooch. I love this project! I would just add that when picking out your tennis balls, be sure to buy some that are lead free. Many tennis balls (even ones made specifically for dogs) contain lead. Thank you SO much for that important information! What a great idea! Thanks for inspiration – again! OK that is just too cute! We need more dog gift ideas as us blog girls all seem to be pet lovers! i love to read your blog and i love the stuff you make. thanks for sharing all these wonderful ideas! 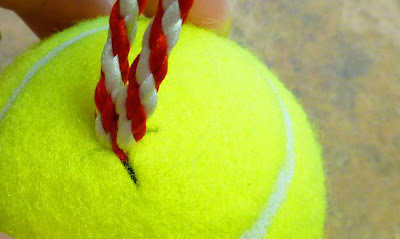 additionally to funky dreams' post i have to say that not only the lead in tennis balls is a problem. tennis balls in general aren't good for dogs' teeth. espacially when the ball gets dirty it's like sandpaper for the teeth. maybe you'll find a way to personalize rubber balls? that would be great! I just love your blog, it's so full of great suggestions, idea and free downloads. Thank you so much for all of it, I'll be following your fortunes from now on! 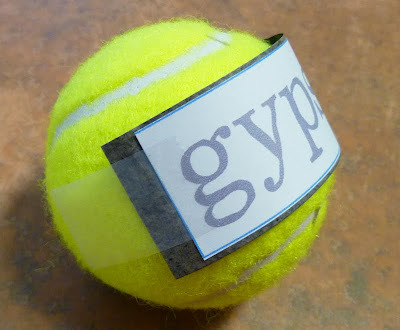 Besides the personalized tennis ball project itself, I love the different fun ideas you suggested. Great post! 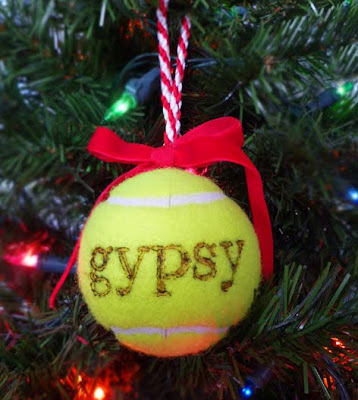 I know a Jack Russell that is always losing his tennis balls (or destroying them) so I will be making him this very special Christmas gift this year – a lead free one of course! I always find inspiration and learn something useful here Cathe! I love that idea. 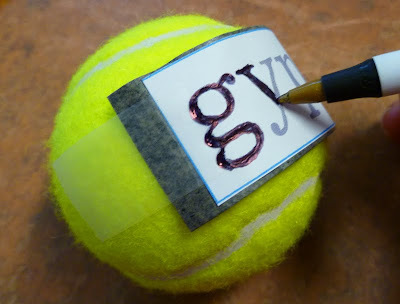 I wonder if you could do the letters with heat transfer paper? Might have to try it. 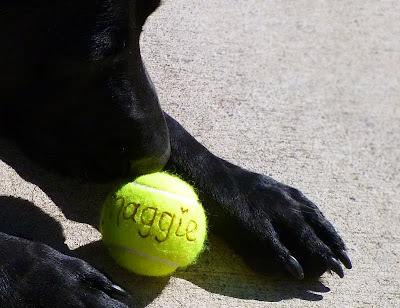 love the personalized tennis ball…..but where did you get the ball/leash holder (hand)? I LOVE IT!! I would love to buy one! Please email me? What I want to know is where you found the hand hook???? It is way cool. Very Creative Cathie. You are obviously very smart and talented.